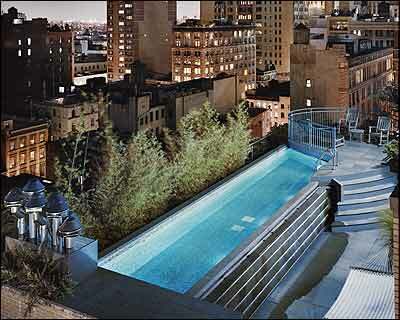 The dream of having one’s own swimming pool typically prompts moves to places like Larchmont or Los Angeles. But Robin Brown, the owner of Clay Fitness and Spa, teamed up with (of all people) her ex-husband to build one in downtown Manhattan: in full view of a few bridges and tunnels, but safely this side of them. “When you have over 3,000 feet of outdoor space,” Brown says, “you really have a lot of freedom.” That indisputable freedom inspired architect Alan Ritchie of Ritchie Hurtado Design to plan the 42-by-8 elevated pool, which has bamboo on one side and a waterfall at the other. In a case of almost unheard-of smoothness, the co-op board and the city declined to put up a fight. Brown doesn’t use the thing for exercise—“I’m a gym baby.” She does throw an excellent pool party. Her ex-husband, however, typically starts the morning with laps. The rooftop is part of a three-level, two-loft complex that the former couple bought together. In spite of “not being able to be married to each other,” says Brown, they get along quite nicely. They live one floor apart, and their 11-year-old daughter moves freely between them, an almost ideal joint-custody arrangement.